The lead generation industry is growing every day. With few barriers to entry and large profit potential, it makes sense that more marketing and media experts are turning their attention toward lead generation. However, despite the influx of new businesses, the top lead generation companies continue to find ways to increase their efficiency, cut expenses, stay ahead of the pack and in front of the money. But what exactly are they doing and what can smaller businesses do to compete? Read on to learn more. Most of the top lead generation companies have transitioned to ping post. While it is not yet the standard in every lead vertical, ping post is the future of the lead industry and by transitioning now, many lead gen companies are taking advantages of opportunities that non-ping post users cannot. Luckily for smaller lead generation businesses, with the right ping post software anyone can bid on and win leads even versus the biggest lead companies. Despite common misconceptions about call routing, it is as strong and profitable as ever. Capturing leads via a toll-free phone number allows lead generation companies another opportunity to convert visitors and sell leads for more. Top lead generation companies rely heavily on their call traffic and enjoy the profits of the premium that they command. Fortunately, any lead company in any vertical can easily adopt call routing technology and start selling calls as well. One way that top lead gen companies streamline their business is with automated rebilling. By automatically billing their clients on the interval and amount of their choosing, a lead generation company can cut countless hours and headaches out of each month and focus on selling more leads. However, you don't need hundreds of clients to make automated rebilling worth your while. With sophisticated automated rebilling options even the smallest lead companies can increase their efficiency and direct their limited time to more important tasks. It seems like all lead companies do reporting a little differently. So quit relying on reports that don’t meet your specific needs. Top lead companies take advantage of custom reports which saves them time and energy. Another great feature to consider is timed reports. Timed reports negate the need to generate reports on a one-off basis and instead email them to you on the intervals of your choosing. SMS deliveries are a powerful yet underutilized tool in the lead industry. While startup lead gen companies may ignore the utility of SMS lead deliveries, top lead generation companies take advantage and cater to their buyers' individual needs. One common example of this is sending SMS deliveries to contractors that are on the go. These buyers can receive their leads without having to check their CRM or email and contact their leads between jobs. For smaller lead companies looking to compete with the industry leaders, SMS deliveries give your buyers an additional reason to buy from you. It's a simple formula: keep the buyers happy and they will keep buying your leads. While most marketing professionals understand the importance of A/B testing landing pages and lead forms, many more do not have the proper tools to conduct this testing. Top lead generation companies utilize software that allows them to easily edit their pages and forms from the back-end without having to change the HTML itself. This is even more valuable for smaller lead companies that don't have the resources to allocate to a professional designer. Simply A/B test your landing pages and quickly identify the design with the highest conversion rate. 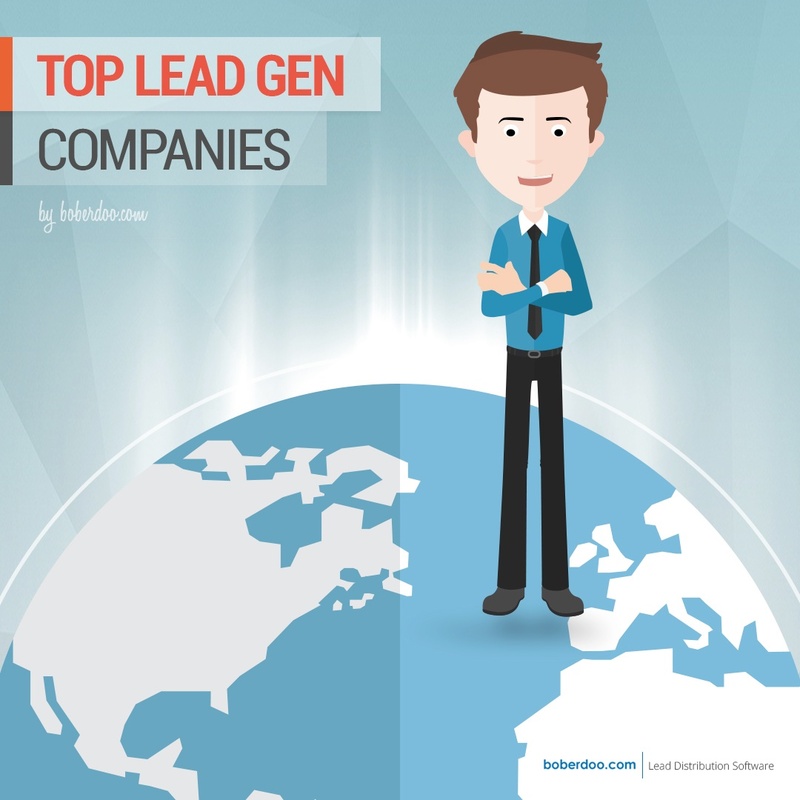 Compete with the top lead generation companies today! While the top lead generation companies utilize many of these technologies and features, even the smallest startup lead gen business can do the same. Many of these tools were built to maximize efficiency and increase earning potential. You may only have 24 hours each day, but these tools will allow you to get the most out of each one. If you’re looking to utilize any of these features or take your business to the next level, you can do no better than boberdoo.com. Our software was designed to automate virtually every aspect of your lead businesses’ back-office tasks. With these capabilities, even a one-man shop can compete with the established lead generation powerhouses. If you would like to explore the boberdoo system in greater detail and determine exactly which features are right for your lead business, feel free to give us a call at 800-776-5646 or click the red Contact Us tab.